Here's an interesting take on a game-improving driver. This Acer XDS is like a cross between a driver and a 3-wood. The design is based on the idea that the shorter, more lofted 3 wood is easier to hit and more consistent than your driver. 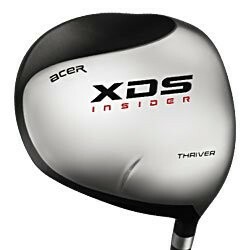 So the makers took some length off of a standard driver, added some weight and a little loft, and bring you the Acer XDS Insider Thriver. What's more is the club has a strong draw bias. Good luck trying to slice this one! The driver head's profile and contour are designed to "encourage an inside-out swing path." In addition, the weighting is specifically intended to produce a draw and the masking on the crown uses something called "Square Optical Alignment System," which disguises the closed face angle to appear square at address. I'm going to classify this club under "gimmick." Don't get me wrong; it will help you fix your slice, and for the price, you can do it very cheaply. However, if you want to invest some money in a higher-end club that will also help you fix your slice but allow you to grow and get better, go with the TaylorMade R9 Supertri. You can adjust this driver for a closed face and add weights to produce a draw. And the best thing about the Supertri is: as your swing gets better, adjust it back to neutral instead of having to go buy a new driver.